If you have any questions about the SUNCHASER information page below please contact us. 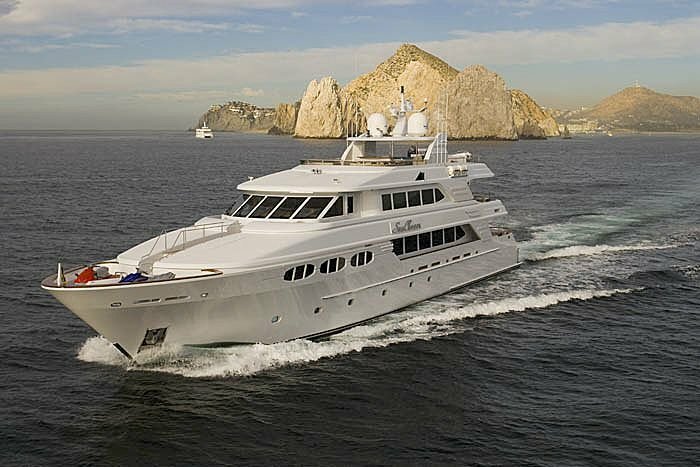 This motor yacht SUNCHASER is a 43 m 142 (foot) ample composite vessel which was manufactured at Richmond Yachts and designed by Setzer Design Group. 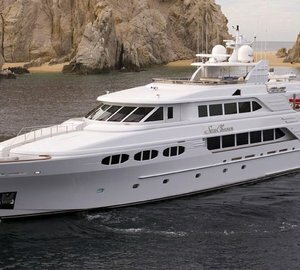 Sleeping 12 guests and 7 professional crew, motor yacht SUNCHASER was formerly 3 which was her project name and/or actual name. Launched by 2006 the comparatively recent internal styling illustrates the talents in the designing of Pavlik Yacht Design. Setzer Design Group was the naval architecture company involved in the technical superyacht plans for SUNCHASER. 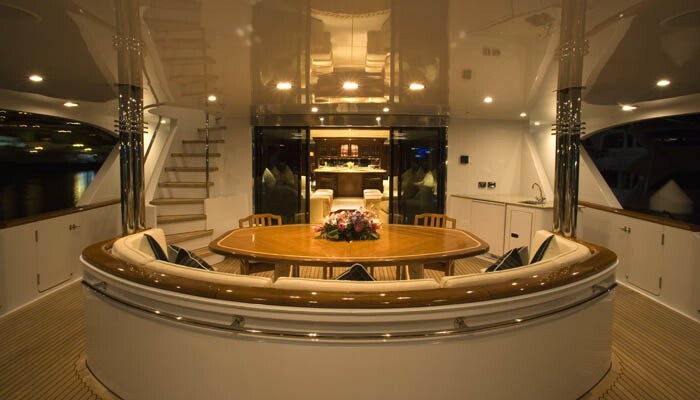 Her interior design was conceived by Pavlik Yacht Design. Setzer Design Group is also associated with the yacht general design work for this boat. In 2006 she was actually launched to triumph in Richmond Bc and post sea trials and detailing was then delivered to the yacht owner. Richmond Yachts completed their new build motor yacht in Canada. The hull was constructed with composite. The motor yacht superstructure component is made predominantly with composite. With a beam of 8.53 metres or 28 ft SUNCHASER has fairly large size. A fairly shallow draught of 2.2m (7.22ft) affects the number of marinas she can enter, depending on their individual characteristics. 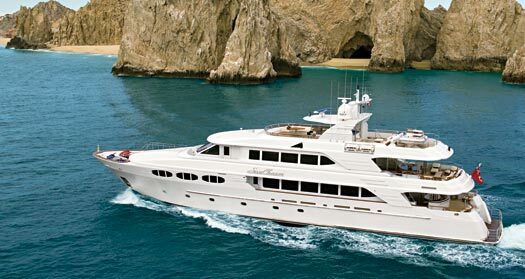 Installed with twin MTU DDC diesel engines, SUNCHASER will attain a high speed of 19 knots. Connected to her MTU Ddc engine(s) are twin screw propellers. She also has an economical range of 3000 miles whilst underway at her cruising speed of 16 knots. Her total HP is 3942 HP and her total Kilowatts are 2982. 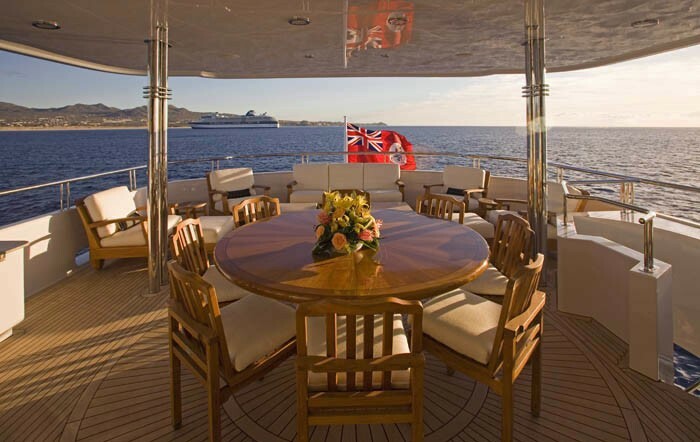 The generous luxury yacht motor yacht SUNCHASER can accommodate a total of 12 passengers and has 7 crew. The propulsion comes from two 1971 Horse Power or 1491 kW MTU Ddc. The Model type is 16V 2000 diesel. Giving the combined power of 3942 HP /2982 KW. 3000 at a speed of 16 knots. Westhampton Beach. United States. Suffolk County. New York. On Sept 2009 SUNCHASER cruised to Dania Beach, in United States. This motor yacht has traveled the area encompassing Broward County during October 2009. 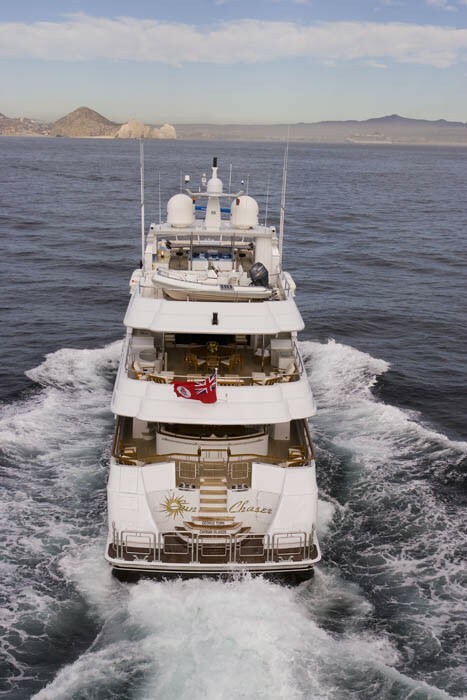 The luxury yacht SUNCHASER displayed on this page is merely informational and she is not necessarily available for yacht charter or for sale, nor is she represented or marketed in anyway by CharterWorld. This web page and the superyacht information contained herein is not contractual. All yacht specifications and informations are displayed in good faith but CharterWorld does not warrant or assume any legal liability or responsibility for the current accuracy, completeness, validity, or usefulness of any superyacht information and/or images displayed. All boat information is subject to change without prior notice and may not be current.